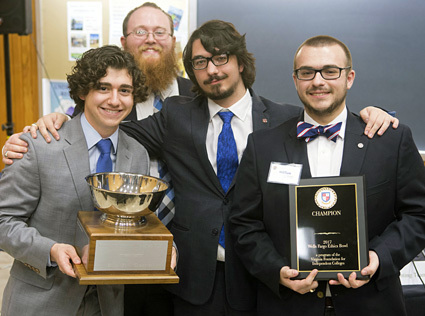 Hampden-Sydney won the Ethics Bowl for the second year in a row. Hampden-Sydney College beat University of Richmond in the final round of the Wells Fargo Ethics Bowl hosted by the Virginia Foundation for Independent Colleges (VFIC), securing victory for the second year in a row. The team, coached by Dr. Patrick Wilson, was comprised of Alexander Vincent Abbott '17, Kole Donaldson '19, William Reed Echols '17, and Samuel Steele Melson '18. During the competition, which focused on ethics and U.S. presidential politics, 16 teams presented their analyses, positions, and recommendations to panels of judges comprised of business, professional, and educational leaders from across Virginia. The case studies debated covered issues regarding privacy, immigration, and national security. 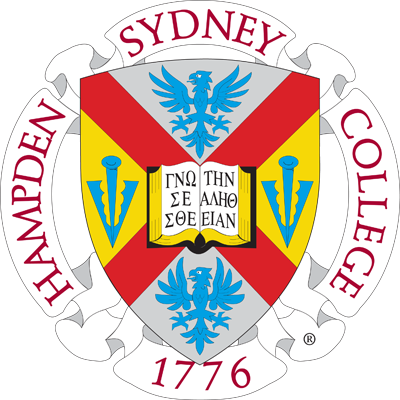 Hampden-Sydney focused on one ethical principle per case, such as respect or responsibility. Each member was assigned a role: open, discuss the ethical principle at hand, talk about the ethical stakeholders, and conclude. They supported their argument with multi-step actions to take and included an emotional appeal to support the ethical dilemma. According to Dr. Wilson, "What distinguished our team was that, instead of focusing on policy or fact-finding, we really focused on the ethics, which is what I think won the round for us." We have a culture where students already believe in living honorable, ethical lives. They appear like gentlemen because they are. Having practiced weekly since September, the team's execution was seamless. Every minute detail of their performance was prepared: what the team would wear, how they would decide a position, how much time each person had to argue, what transition would be used between teammate's arguments, and what hand gestures to use. With a focus on civility, Hampden-Sydney's campus culture puts students at an advantage in the competition. "We have a culture where students already believe in living honorable, ethical lives," Dr. Wilson noted. "They appear like gentlemen because they are." The strategy has proven to be successful. In addition to the team's two-year winning streak, they have won four of the past six years and competed in the finals six of the past eight years. Next February, Hampden-Sydney will host the ethics bowl, where the team hopes to keep the Batten Trophy yet again.